For my daughter Campbell Claire’s first Halloween I couldn’t resist this cliche. So many people had already referred to her name as, “you know, like the soup” that the idea was planted months in advance. I used regular cotton knit fabric for the body of the suit. Around the middle, where the two colors meet, and around the bottom of the suit I sewed pipe cleaners into the hems. This was so I could have a flexible hoop that was still conducive to the car seat and comfortable for a 3 month old but still help the costume hold a tubular shape. I used gold rick-rack for the trim along the bottom and a decorative button (closest thing I could find to the golden seal on the front of Campbell’s soups). Since the costume was a play on her name I decided to use her middle name, Claire, in place of Soup and instead of listing the weight of the soup can I listed her actual weight at the time. A long sleeve red shirt and white tights went underneath to keep her warm and finish off the costume. The result was absolutely adorable and got rave reviews by all who saw it! Took a couple of evenings to complete and maybe $20 total cost (we already had the tights and shirt. YOU ARE SO CLEVER! I LOVE THIS SO MUCH! REMINDS ME OF ANDY WARHOL! 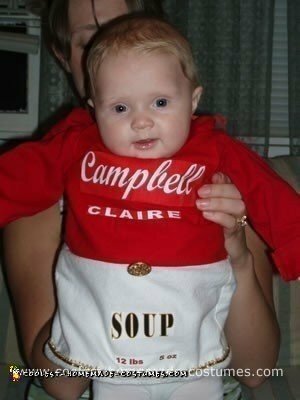 I too have a daughter named Campbell. Rare to find another one! I love this idea. I also have a 2 year old girl named Campbell! Love It. I have a one year old daughter named Campbell Reid and Googled this to see of any ideas where out there… I too just can’t help it! !